This Nasara-Nazarene addition/page has two bookends if you will, a required front and back context. The front-bookend is this… most everyone is familiar with John the Baptist, a cousin of Jesus, and his ritual of cleansing through water immersion. This ritual also happens to be a critical ritual among the Essean-Essenes of Qumran made clear through their Dead Sea Scrolls and hinted in the Canonical New Testament. This association is important because the early Christian Church (followed later by the Vatican) attempts to dissociate Jesus from his time and culture — i.e. the direct and undeniable influence of that culture on Jesus — and then the attempt by Jesus to ritualistically inaugurate a sectarian Messianic Kingdom of God on Earth. Jesus quite probably had a mixture of Essean-Essene rituals as well as Arabian Nazarene-Nasara rituals that Pharisees inside Jerusalem and the Temple had serious contentions about; again known through the Dead Sea Scrolls and subtly found throughout the Canonical New Testament. Why Arabia? What was so important there to spend 2-3 years before consulting the Jerusalem Church for further understanding of Jesus’ idea of Messiahship? The most compelling answer is Jesus’ and John the Baptist’s dual link to the Arabian Nazarenes-Nasara and their own Scriptures about Israel’s savior/Messiah in their tradition. Paul wanted to know and understand, but not from Jerusalem. Arabia seemed to have his answers — the backside bookend and the latter part of this page. The Essene contributions of ritual baptism and inauguration of Jesus’ Kingdom of God on Earth cannot be ignored. 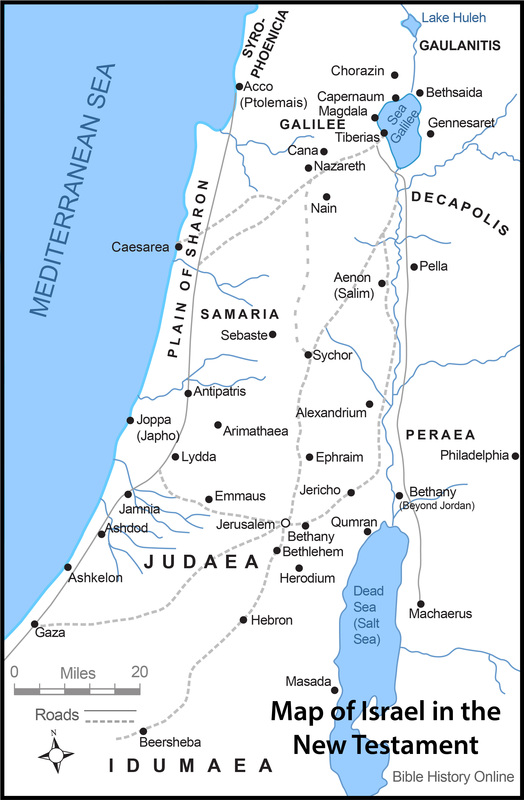 The idea that Messiahship was strictly an Old Testament principle was cast aside when the Dead Sea Scrolls at Qumran were translated. Instead, biblical scholars and historians such as W. H. Brownlee and Marcello Craveri, assert that Jesus’ cousin John (the Baptist) was most likely a key figure of the Essene community. Both scholars note that John’s exhortations of repentance through immersion was practically identical to that of the Essene teachings found in the Dead Sea Scrolls. The present-day archaeological site at Qumran has three mikveh baths for ritual immersion. The connections, dare say, direct connections between the Essenes influence upon Jesus are numerous. Perhaps the two most striking similarities are the Essene eucharistic meal of bread and wine. The other similarity are the Qumran scrolls speaking of a great teacher, a Teacher of Righteousness, who in some texts is yet to come and in other texts who has already come, adding further that this Teacher has suffered martyrdom and reappeared to his followers. These four verses in Galatians, along with other related verses, are a distressing conundrum for fundamental Christians. The usual treatment of these verses is to quickly bypass them, sweep them under the academia-carpet, if you will. What is very strange about Paul in Arabia is not only that he spent three whole years there, but why did Paul not say hardly anything about that stay or its significance and purpose later in his many epistles? Obviously it was more important to go to Arabia before Jerusalem. Why? Historian and researcher Kamal S. Salibi of the University of London and American University of Beirut, picks up on two anomalies with Paul’s decision after conversion on the road to Damascus — not to mention his “miraculous” healing from blindness by Ananias there — and why Paul felt the need to emphasize he was not lying (v. 20) to his followers in Galatia. Once he returns to Damascus three years later with whatever he has learned or found, then he goes to Jerusalem to see only Peter and Jesus’ blood-brother James. Salibi finds it very interesting that the blood-brother of Jesus, like Paul, is a latecomer, maybe even a party-crasher. James the brother is utterly unknown one minute, then head of the apostles in Jerusalem the next — and with no prior credentials. Yet, maybe his name and blood did indeed amount to all the best credentials? And why does Paul feel the need to stress he isn’t lying? Fourteen years go by before Paul ever returns to Jerusalem, that is fourteen years without Nazarean-Nasara ordination of apostleship. A total of 17-years pass before Paul receives his official apostolic recognition from James during his second visit to Jerusalem. The fact that Paul swears before God that he is telling the entire truth is indicative that there was some other story about Paul’s authority already circulating around Anatolia. See Gospel of the Nazarenes. The fact that Paul’s journey to Arabia has been meticulously rearranged into another variation story suggests, among other things, that the Nazarene apostles of Jesus had something to hide and/or they did not want to give authority to Paul based upon an epileptic roadside vision and healing. So what was in Arabia that was so important? With the assistance of Michael Goulder (Trinity College, Oxford and Cambridge) and French philosopher Simone Pétrement (author of A Separate God: The Origins & Teachings of Gnosticism), we can find the three-pronged roots of Paul’s Neo-Christology: Judaism, Arabian Nasara-Nasorean, and to the surprise of many, Samaritan. God would some day send a prophet like Moses. This sheds light upon Paul’s strange sometime incoherent theological developments. When he arrived back in Judea-Palestine, his new ideas were at serious odds with Nazarene beliefs about Jesus. But Simone Pétrement puts the final clarifying touches on Paul’s three-pronged influences. the Dositheans were Christian heretics, or, more precisely, they were among those constituting the transition between Jewish heresies and Christian heresies. It is worthy as gold to note that there are only two passages in the New Testament where the title of “Gift of God” (Dositheos) appears, and both passages are linked contextually with Samaria. Why the mixing and interchangeable names and identities all throughout the New Testament? Intentional or gross ignorance? Please note that this page is a very truncated elaboration of the Arabian Nasara-Nazarenes connection and Paul’s blatant early conflict with the Nazarenes, or Judeo-Christians (as popularly known today) in Jerusalem such as Peter and Jesus’ blood-brother James.